Today I created another version of the fish plaque, taking things up one more notch of course. I started with the very same vectors. First I added another oval using the offset tool to make the plaque a little bigger. You’ll see why a little further down. 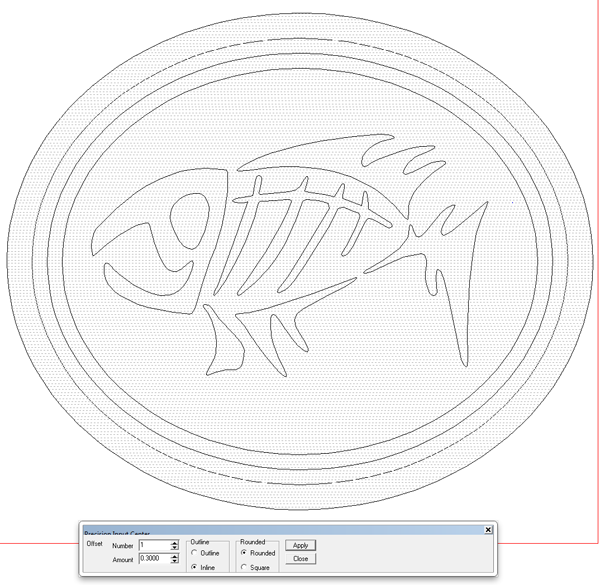 After selecting the outside vector I opened the create relief menu and selected the bevel tool. I also selected the LIMIT TO HEIGHT option. I set the angle to 40 degrees. The base (height of the edge before the angle starts) was set to 0.5″ The overall height (where the relief would be limited to was set at 0.8″ tall. Then I hit enter. I failed to grab a rendered screen shot but the effect can be seen further down this post. 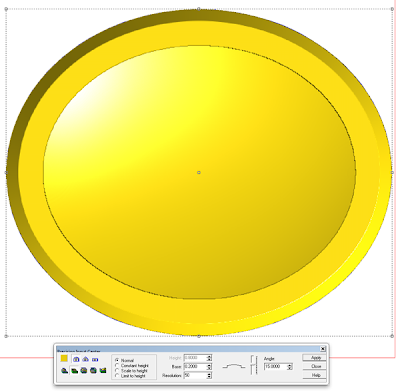 The purpose of doing things this way is to create a nice bevelled edge around the oval. There are plenty of ways to do this in EnRoute but this works real nifty. 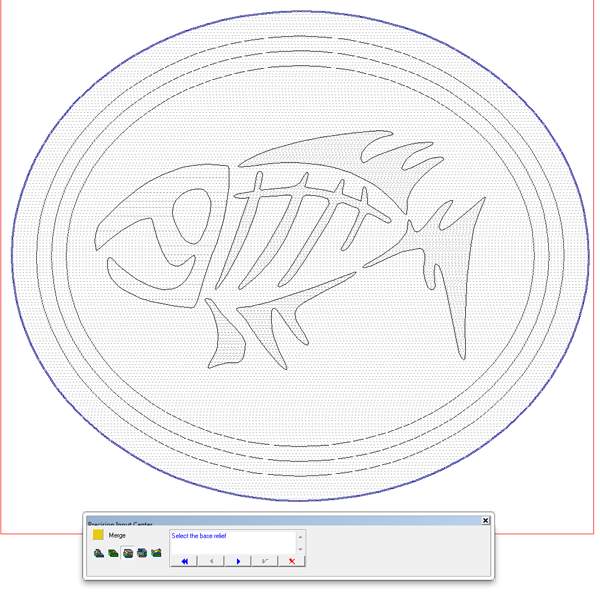 I then used the vector offset tool to create some inside ovals. 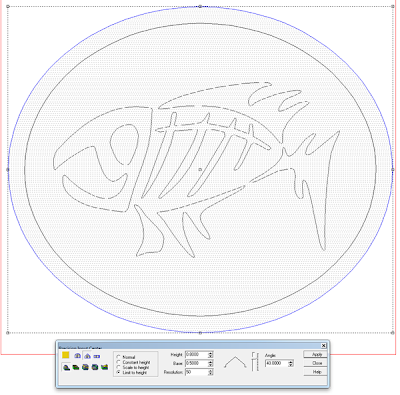 These were created with an inside offset of 0.3″ For this entry we’ll only use the inside one but the reason for the extra wide border will become apparent next time. I then opened the create relief menu, selecting the SUBTRACT OPTION. I wanted a BASE of 0.2″ This is how deep the hole will be before the curve starts. The angle was set at 15 degrees. 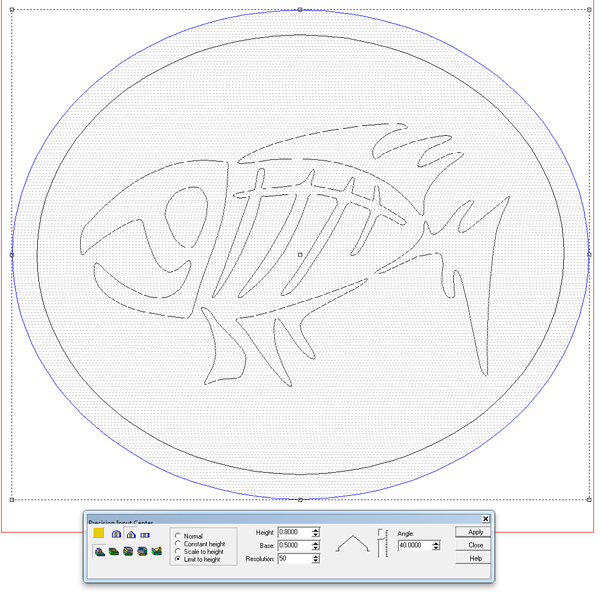 Then it was time to build the fish. 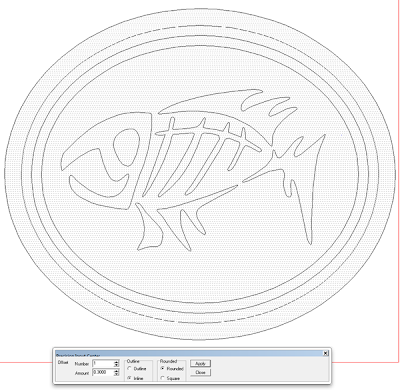 This time it would be done as a separate relief which we would MERGE HIGHEST with the base relief at a later point. 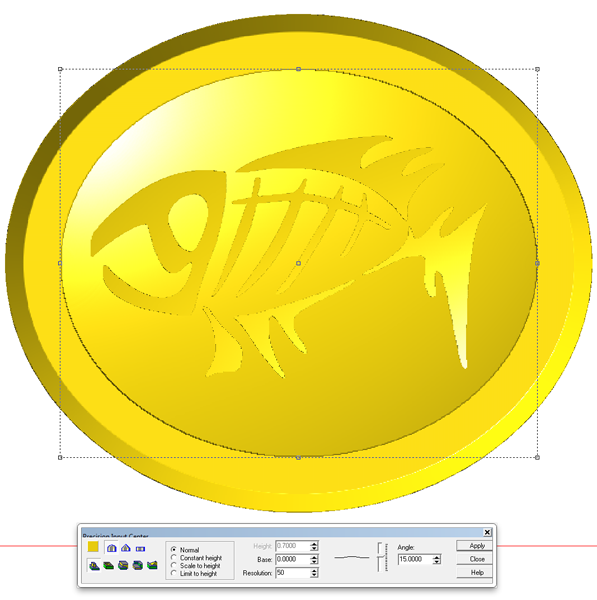 I selected the fish and created a flat relief 0.8″ tall. The height arbitrary as you will see later. Then holding down the shift key I also selected the inside oval. I would use this oval to MODIFY the flat fish relief using the dome tool. I used an angle of 15 degrees. I then went to the front view and turned the render off. 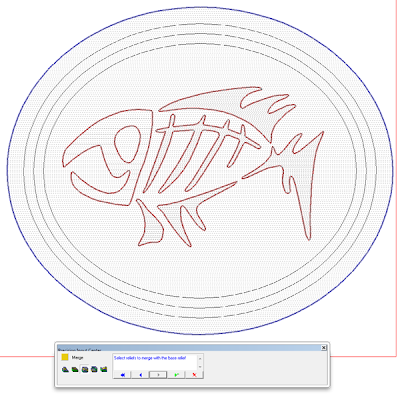 This allowed me to see the fish in relation to the bowl. The fish was a little high so using the down arrow I nudged it down. The fish now sticks below the bottom relief but it does not matter for we would next MERGE HIGHEST with the base relief.. I opened the MERGE RELIEFS dialogue and following the prompts selected the base relief and MERGE HIGHEST control. 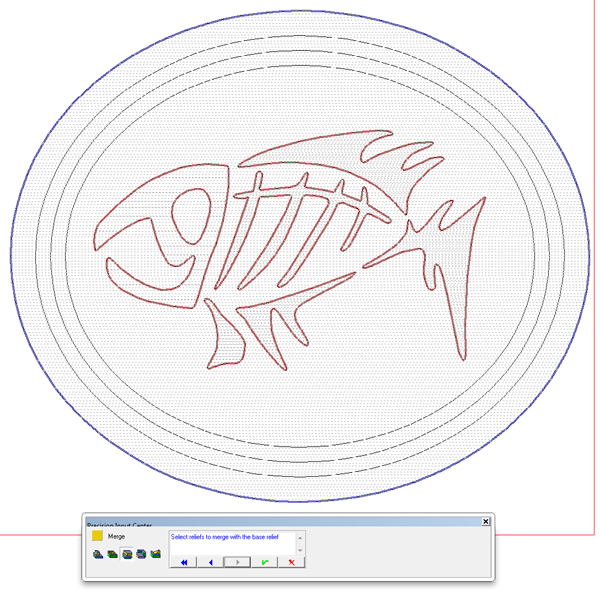 Then I selected the various parts of the fish. This has to be done one piece at a time. 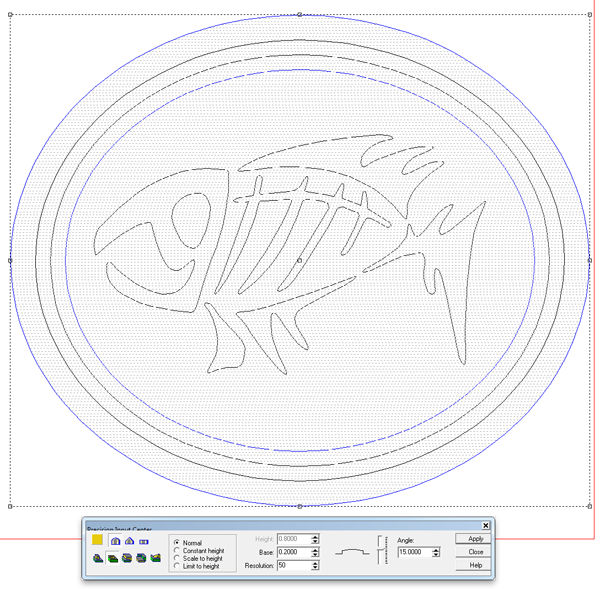 The final result is a bowl that curves downward and a fish that has a pleasing curved upwards shape. 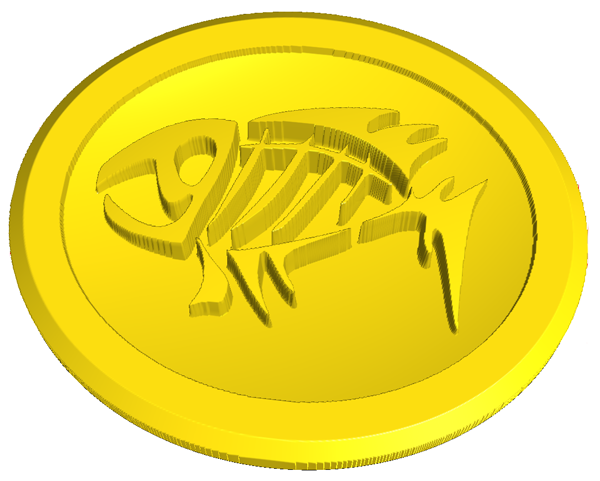 The original fish relief can be deleted or moved to another layer and turned off.